Randy Alderson Spelling looks more like a girl than a woman. So tiny she’s nearly lost in the cushions of my office couch. Her legs jut out over the floor until she scoots forward and places her feet squarely on the ground… I’m the last hurdle between her and the job she covets — police officer for the Kenilworth Police Department. I could not be more honored to talk to author and police psychologist Dr. Ellen Kirschman. A writer of both fiction and nonfiction, Ellen captures the world of police officers with tremendous depth and nuance. It’s a world she knows well, having worked in the field for thirty years. 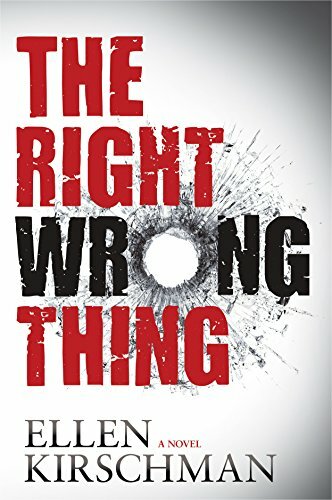 The Right Wrong Thing is the second book in the Dot Meyerhoff series, and is just out in paperback. Her first novel, Burying Ben, introduces her protagonist in a wonderfully suspenseful tale. Interested in her nonfiction? 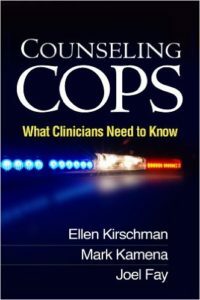 Her latest book is Counseling Cops: What Clinicians Need to Know and she is in the process of writing the second edition to I Love A Cop: What Police Families Need to Know. First responders aren’t limited to police officers, and Ellen has also written I Love A Firefighter: What the Family Needs to Know. Check out her page, and don’t miss her donut metaphor. It can transform the way you look at the world, even if you aren’t a first responder. Speaking of which, the First Responder Support Network is an organization near and dear to her heart, if you want to check out the excellent work they do. As always, if you’d rather read than listen, the transcript is below. Enjoy! Laura Brennan: My guest today is Dr. Ellen Kirschman. Her first novel, Burying Ben, introduced police psychologist Dr. Dot Meyerhoff and the officers she helps — a world Ellen knows well, as she herself has been a police and public safety psychologist for over thirty years. Ellen, thank you for joining me. LB: Let me start off by saying, I didn’t know that police psychologist was an actual job. How long has it been around? EK: I’ve been doing it 30 years. There have been people doing it a bit longer than I have. There are about 200, give or take some, people who, psychologist whose main practice is police and public safety. By public safety, I also mean firefighters, dispatchers, emergency medical techs, sometimes emergency room nurses. LB: There’s always been such a feeling that the police have to be macho — and in fact, I think you mentioned one of your books the idea that seeing a psychologist can be seen as a weakness in and of itself. So I love that they have started to really incorporate it into part of the job. Was that a big hurdle to overcome? EK: Well, it was a big hurdle and actually it still is. Of the several hundred police psychologists that exist now, most of them do preemployment screening and fitness for duty evaluations. So they are acting in some ways like traditional psychologists and that their primary work is assessment. Those of us who do clinical interventions represent a smaller percentage of people. I worked for one police department where I was in house, inside the actual physical building, two days a week for 25 years and the day that I left, there were still officers who were sure I had a videocam that went from my office right to the chief’s. And then of course people who actually came and talked to me realized that that was not the case and that I knew how to keep secrets and keep their confidentiality, because that’s primarily, they’re worried about confidentiality. And as you said, the culture for both males and females is somewhat that kind of rugged, individualistic/macho sort of culture in which the thing you never want to appear to be is weak. And of course I tell people, you’re not weak, you’re human and to be human is to have problems, is to have emotions that you don’t always like and is to react to things. So I think slowly that culture has changed so that people are much more accepting of things like debriefings after some kind of horrible incident. But, you know, generally speaking there is always that resistance. The First Responder Support Network, where I volunteer, we are a collaborative group of peer supporters, those would be cops or firefighters who have been through the program, chaplains and clinicians who are culturally competent to deal with cops. 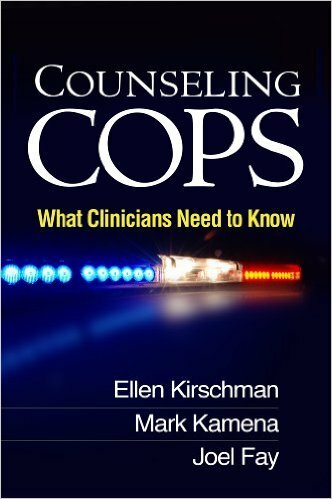 My third nonfiction book, Counseling Cops: What Clinicians Need to Know, it’s so hard for cops to reach out and get help, for their families as well. So if they run into somebody who doesn’t understand what they do and why they do it, then that turns them off. And we have any number of stories. An officer who had been involved in two fatal shootings and was having terrible nightmares and all sorts of considerations about should he quit or continue to be a cop, goes to see a therapist and the therapist says to him on the first session, “So, are you ready to stop being a trained killer?” What a horrible thing to say to somebody. Turn this poor guy off, but he didn’t know how inappropriate it was because he never had any experience going to psychologist. And it wasn’t until he talked to some of his fellow officers who said to him, “We’ve got to find you somebody who understands what you do.” So that was the motivation for writing the book, Counseling Cops, and I wrote it with two of my psychology colleagues, both of whom are retired cops. So I think it brings a richness to the book that they could bring their own experiences. LB: Burying Ben was your first novel. Why did you turn to fiction? EK: Well, I kinda got tired of reality. I thought, gee, it’s got to be easier to make stuff up then to do all of the research. I was, in fact, really wrong about that. It’s way harder to write fiction than it is to write nonfiction. In nonfiction, you kind of do it like 20 term papers. It should be obviously readable and carry the reader along, but you can pick up chapter 5 of a nonfiction book, read it, go to New Jersey, come home and pick it up again and you’re not lost. But in fiction, we all as readers want to be swept away in the story. We want to keep turning pages and never put the book down until it’s finished. So to develop that skill was way harder than I was anticipating. I also thought that fiction — and this turned out to be true — fiction gave me the opportunity to say and do things that I really couldn’t do as a working psychologists without getting fired or sued or losing my reputation. So I got to play a lot more with the fiction. It was also great opportunity for some payback. I could have an opportunity to poke fun at some cops who hadn’t been very nice to me my career, and to some of my fellow psychologist whom I thought were a little on the wacky side, to a couple of my ex-husbands. EK: It was really fun. LB: I want to talk about your series protagonist a little bit. EK: Dot Meyerhoff is named after my mother, whose first name was Dot, and my grandmother who was Meyerhoff. I never met my grandmother. She died before I was born. So it gives me some pleasure to try to continue their legacy that way. It’s also important, it becomes important in certain aspects that she’s Jewish, so that makes her even more of an oddball. She’s around 50, and so she’s also dealing with things that I think are really very important, and certainly if you look at television dramas about police psychologists, these are always pretty young people. And I think it’s important, this whole business of aging is very interesting to me. So I get to bring that in as well. And Frank, whom everybody loves, Frank is really modeled after my husband, Steve, so much so that I’ve actually plagiarized Steve’s, almost his entire life. LB: Oh, is Steve okay with that? EK: (Laughter) He is. I don’t know about the rest of his family, but — no, no. He is. And it’s a big joke in the family. LB: Everybody loves Frank, but I have to tell you, most of your fans also love Eddie. EK: I know. Somebody says he deserves his own book. LB: He is a tremendous character. EK: Yeah. He doesn’t get as much play in the third book as people might like, but he’ll come back. Not to worry. LB: So I don’t want to ask is Eddie’s based on anybody, because I don’t want you to get in trouble. EK: Actually, there was like a lottery about people in one police station where I’d worked, trying to guess who Eddie was based on. Actually, Eddie is based on a composite of several people, and I started out — this was one of those payback things. There was an officer that I’d had a lot of difficulty with, and I thought was just full of himself, I just didn’t like this guy at all. And then I brought in other people that I like a lot and it suddenly became this composite person of a loud, central casting kind of cop with a heart of gold. So in fact he is based on several people. LB: The world that she is part of, as a police psychologist, is immediately macho. Very testosterone driven. Very gallows humor, very harsh. You can see the coping mechanisms at work. And she comes into it and she is so very human and multidimensional and caring. Did you want her to be in opposition to this world, or — how did you come up with her character? EK: Wow, that is a really good question. A lot of people who know me say that Dot is very much like me. People that know me frequently ask, “Did you really do that?” And I have to say no, of course not, I would have lost my license for doing some of what Dot does. But in many ways, she’s very much like me. When I started to write fiction, I first started in third person and boy, it was awful. It was terrible. It was unreadable. And it took off when I switched and began again writing in first person and really in my own voice. Dot is very much similar to me. She’s a little younger — she’s a lot younger — and she’s thinner than I am, but we share a lot in common. I’ve now written a third book, which is not yet published, it’s not my publisher’s. She’s gotten a little less crazy about the kinds of things that she does, she’s putting herself in less danger than she has in prior books. LB: One of the issues in your novels is how crucial psych evaluations are to hiring new cops. Did you work with a lot of rookies? EK: I have done only very, very little of the preemployment screening in my life. I didn’t much like doing it and I thought that many psychologists’ efforts would be better spent screening agencies were cops went to work, to see which agencies treated their employees well. But of course, it is really very important. What many people don’t realize is that you’re not screening them in, you’re screening them out. You’re not screening people for how well they’re going to do on the job, but rather you want the people who you know just simply won’t be able to handle the job because of various factors in their background or in their personality. I worked a lot with rookies, and one of my favorite things to do was to work with the field training program. Ben was in the field training program and Eddie was his field training officer in my first book, Burying Ben. It seemed to me that field training could really benefit from the application of behavioral science principles to what they were trying to do. To train, to take someone who had once been a civilian, just come through an academy, where they knew how to be an academy student and then put them out there into the real world. That’s a big transition. I liken that transition to the time when I was learning how to scuba dive and the moment I went from practicing in the pool into the ocean. Where there are currents and rocks and fish with big teeth. It was just an entirely different world, a reality that you cannot simulate in his room pool in the same way that police work is a reality that you can’t simulate in a classroom. So the field training program is really important. You’ll hear cops who’ve been on the job for 20 years and they get into a jam and they can still hear their field training officer’s voice and their ear telling them what to do. It’s also a place, I think that officers, more senior officers who are trainers can model self-care. And how do you survive over the years and extend your shelflife as a cop by taking care of yourself. What you need to do? What you need to avoid doing? And there isn’t enough of that. The focus is much more on tactical stuff, on the law, on defensive tactics and much less on self-care. A great deal about training, and I’m sure you seen this in all of the current controversies about policing community relations, is that we can do a way better job devoting more time and more skill and teaching officers about de-escalation tactics as much as we do about defensive tactics. And also as I just said to add, about how do you take care of yourself? How do you manage the stresses and emotional problems that come up on the job? LB: Eddie, as you said, it’s a field training officer. He is not a model of self-care, shall we say? LB: Well, in your second novel, The Right Wrong Thing, de-escalation tactics — that is actually one of the things that you say women officers can bring to the job. Have you seen that increase over the years? EK: Well unfortunately, in the 30 years that I have been working with law enforcement, the percentage of women in law enforcement has actually gone down by a few percentage points. EK: Isn’t that awful? They represented about 10% of street cops and now I think — they did when I started — and now I think they’re down to about 8%. There are many more police chiefs, female police chiefs than there had been before, but not terms of the rank-and-file. And I think that’s really unfortunate. Recruiting given the current atmosphere is going to be really a challenge for law enforcement, and I think recruiting women in this current atmosphere is going to be even more of a challenge. But what we do know is that women, our ability, the way we’ve been socialized in this country, our ability to deal with relationships, the way our brains are organized, our ability to communicate and to use verbal rather than physical tactics seems to be very good and very useful in terms of settling things down. Women are just, they can be just as tough as men, I don’t want to be misunderstood about that. And so we find that women are less likely to get physically involved with somebody who is disrespectful, calling them names, uncooperative. You know, whereas a guy might feel challenged, that’s back to that macho thing, or feel like he has to show everybody else how tough he is. I think women are a little slower to react that way. Now, in the second book, The Right Wrong Thing, of course without giving away, making any spoilers for the plot, you can see that our young, female rookie, Randy, feels under pressure to show what she can do because of a previous incident in which she was criticized for not being aggressive enough. 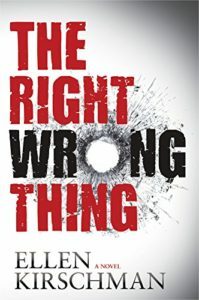 LB: The Right Wrong Thing is about to come out in paperback. What was the genesis of that? Why did you choose that story? EK: Many of the people in the stories in my books are based on people that I have dealt with in my role as a psychologist or things that I have witnessed over the years that I’ve been writing around in the back of police cars. So there’s a genesis of truth in all of them. And Randy’s character and what happened to her is based on an actual officer that I dealt with. The situation was different than is described in The Right Wrong Thing, but this female officer was forced to shoot and kill somebody and then — she was a woman who had not been well-accepted into her department because she was a female. She had all kinds of problems with her fellow male officers. And when she shot and killed this individual, she suddenly became a hero in her department. Guys who wouldn’t speak to her before and had no respect for her beforehand were now singing her praises. And that absolutely repulsed her, that that would happen. That that was the way she could get into the club she had never wanted to be part of. I wanted to write about that woman’s experience because I thought it was extremely important. In terms of Burying Ben, I wanted to write about suicide and police departments because that is an issue that for a long time was really not talked about openly and what we do know is that a police officer is — I mean, there’s some controversy about the exact statistical reading on this — but we know cops are generally more likely, twice as likely to kill themselves as they are to be killed in line of duty. And that’s a pretty horrific and not well known statistic, in particular when you consider that police officers are highly screened before they get their jobs. LB: That is horrific and really eye-opening. And it also brings me to something you have gone out of your way to talk about, and that the idea of control. You have that on your website, and I will link to it in the show notes, you have the idea of the doughnut. LB: Can you talk about that a little bit? EK: Sure. Police work is all about control. Control of other people — I mean, we call cops when we have lost control of our own situation. You don’t call a cop when you’re having a good day. So, it’s all about control of the situation and then control of one’s own emotions in the middle of the situation. If you lose emotional control, you are apt to get hurt or hurt somebody else, or get sued. So if you think about, somebody spat on you, your human instinct is to give them the back of your hand. Well, you can’t do that when you’re a police officer because you have too much power in that you are special to control yourself. The problem is that cops can learn to turn off their emotions when they are in their professional role. The problem comes when they can’t turn it back on again when they’re at home. Because what we know that creates family is the ability to be accessible and vulnerable to each other. Now, the doughnut metaphor is a really good one that we use at The First Responder Support Network, which is a place that I hold dear. We treat first responders and their families when there is some PTSD, Post Traumatic Stress Disorder, or injury as we call it. And we tell people, look, imagine a doughnut, the inside of a doughnut, the donut hole there. That’s what you have control over in your life. That is your own ethics, your own beliefs, your thoughts and your own actions. And why you do have control over that, we all of us know how difficult that is, if you’ve ever tried to go on a diet or change some kind of ingrained habit, it’s not easy. But that’s the area of life over which you have control. Visualizing the donut again, the part that you eat, that’s your sphere of influence. And we have the ability to influence family, friends, coworkers, the general public by how well we relate to other people, how will we communicate, by our own actions being role models for other people. These are areas of influence, but it’s not control. And then everything outside the donut is the whole rest of the world, that big wide world out there over which we have so very little control. And when we try to control people over whom we have either influence or no influence and we fail to control them, because it was impossible to start with, that can create problems. People can feel like they have done something wrong, or they are inadequate, because they’ve lost control of a situation. So often dealing with officers, they will, because control is so important to them, they don’t like to think that there are random happenings in the world, because we have no control over random happenings. They don’t like to, they have a necessary but unrealistic belief that they can control every situation because of their training. So they get to a situation and they don’t control it, then they feel terrible about it and sometimes turn on themselves and blame themselves. And we have to say to them, look, that person might’ve been dead before they hit the ground, how do you know that? We get what we call magical thinking, “If only I had…” — fill in the blanks. Turn left instead of right, got there five seconds faster or five seconds slower, that child would be alive today. And we really have to tell people, look at the donut. What over that situation, what part of it did you have control, and what part of it did you have influence, and what part of it did you have nothing at all? It’s a pretty eye-opening conversation to have with people who are blaming themselves for something that perhaps they had no ability to change right from the get-go. LB: That is a great tool. And I was actually just thinking how much my mother, who was not a first responder, but who did fall to a lot of magical thinking about what she could’ve controlled, would’ve benefited by really understanding that. That’s — what a gift you give people. EK: Many of the things that we talked to cops about, I get this feedback about my nonfiction books all the time: you could have written that about me and I’m not a first responder. People tell me that all the time. Because, you know, cops are humans like everybody else, so what works for them works for a whole lot of other people. LB: Well, let’s talk a little bit about your nonfiction. You actually came to helping first responders by starting, you were helping their wives. LB: That first class you taught on how to love a cop, when did you realize the need? EK: I was working in a psychiatric clinic and I was at the time a clinical social worker. And a number of police spouses came in to see me. They were all women, at that time there were very few women in law enforcement. And they talk to me about what was happening in their home, and I thought, gee, this is kind of interesting. And I had myself a brief stint, about two and a half, two years, as a probation officer. So I had touched that law enforcement universe a little bit myself. And I thought, some of this behavior that these women are seeing in their husbands could really be explained most likely by the job that they’re doing, the job of being a police officer. And I thought, I’m going to think about putting together a class for police spouses. As soon as the catalog came out, the class was filled and we had 40 women on the waiting list. So I knew I had hit an unmet need. It was clear that nobody paid any attention to families. Families were considered unpaid assistants to police departments. If you had a husband with Post Traumatic Stress Injury, having nightmares or screaming in his sleep — these women are psychiatrists, but they were expected to sort of patch things up and fix things up at home. EK: Yes, that was my reaction as well. All of that came together and motivated me to go back for my doctorate in psychology and then my dissertation, which was kind of a mix of Sigmund Freud and Mickey Spillane, I began to look at what happens to police officers over time. How do you enter the field as a trusting, open, optimistic, extroverted person and leave it damaged? And I did what we call an intensive case study of three officers and their families. And that was how I got started, and I thought, I should write a book about this using the same title, I Love A Cop. Well, another 20 years goes by, and by now I have a lot of experience, and that’s when I sat down and wrote the book. And that was, gee, I am really dating myself here, that was 20 years ago. And I am right now, as we speak, under contract to put out a second edition and to try to bring some new things into the book that address the current atmosphere of difficulty between the police and communities that they serve. LB: That is such an important book. I’m so glad to hear that you’re doing a new edition of it. Well, thank you so much for joining me, Ellen. I appreciate it.